The DISA Mould making and Conveyor System is the most advanced facility that produces dimensionally accurate castings very consistently. The fully Automatic Sand Plant is controlled by computers which ensure that Sand, Bentonite, Carbonaceous material and water are mixed in the right proportion. The DISA Technology facilitates easy storage and retrieval of production data, easy handling and changing of patterns. Inmould inoculation and Stream Inoculation are carried out automatically to obtain desired microstructure and mechanical properties. 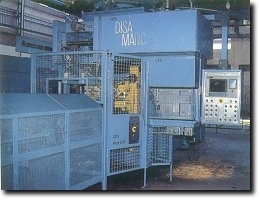 Synchronsied Belt Conveyor System transfers the mould to the DISA Cool Drum where the castings are seperated from sand. Whereafter the sand is taken back by conveyor for recycling. The casting then undergo Shot Blasting & fettling.